Here are 16 devices that unobtrusively blend into modern homes to provide the latest in residential technology. 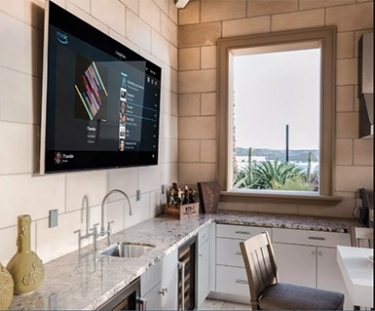 Utilizing the latest in technologies from Control4, this home is backboned by the new Control4 2.10.4 operating system (OS) to support the use of services such as Amazon Music. Underscoring the custom in custom electronics, today’s era of home electronics are less intrusive than ever before. Designed for applications far beyond new construction, today’s hidden electronics are just as adept at integrating into existing homes, and because of the evolution of technology, they cost less than previous generations of similar products. Fueling the development of these products has been advancements in wireless network reliability, engineering experience, and new industrial designs. Backboned by improved network connectivity as well as faster Internet speeds, consumers see the return on investment into products like thermostats, shade systems, lighting systems, and security systems. The surging interest in the smart home is sparking sales in traditional residential electronics categories such as home audio, video, and control. Now with more people learning about all of these systems and how easily they complement one another within a home, a growing number of consumers are educating themselves on the specific benefits these solutions provide for integration into their homes. With these products, consumers have the ability to schedule and control the heat, shades, music, security systems, and other home systems through easy to use app-based interfaces. Immediate control capabilities are also provided as easily as issuing commands through Amazon Alexa and Google Home integration. The latest in hidden electronics products often offer complementary aesthetics, high levels of functionality, more approachable pricing overall, and improved user-friendliness.